On the fifth anniversary of the start of the Iraq War, Larry Doyle, the Baghdad bureau chief for CBS News, submitted this inside look at what it takes to cover this war. And he should know: Larry's been producing our coverage of conflicts and wars for four decades. Yes, you read that correctly: four decades. 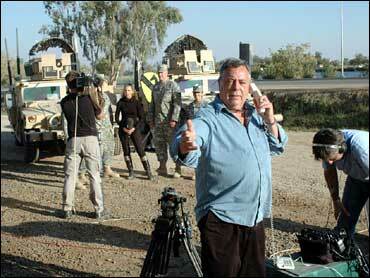 So, read on, and enjoy this photo our foreign desk dug up of Larry working with Lara Logan in Camp Victory, Baghdad. When American troops crossed the sandy berms marking the border of Kuwait and Iraq, I was afraid, anxious and frightened. Frightened, even though I was a good 50 miles away in a swank Kuwait City hotel suite (that doubled as a CBS News office) surrounded by solid walls, with good communications and room service. A dozen or so CBS colleagues were out there in the dark, inhospitable desert, some hearing angry gunfire for the first time and virtually cut off from the world. They were the "embeds;" the pentagon's journalist frontline. I had seen combat, reported on wars, and knew they were in the middle of a life-changing and life-threatening event. I thought about Iraqi friends who, even farther north, were also terrified, crouched and bundled under beds, cars, and shelters as "shock and awe" rained down … and changed their lives. I prayed equally for our embeds and my friends. All the CBS News team survived their grueling three week odyssey toward Baghdad. They had safely passed the "speed bumps on the road," which is how the American command advertised the march through Iraqi towns. Many of the bumps became deadly speed traps. My Iraqi friends, for the most part, also were unharmed. A couple lost homes, other friends lost businesses – but no one lost a life. Months after Baghdad was "liberated," I returned to the Iraqi capitol. Baghdad has never been an attractive city. Approaching I recognized the dusty, brown sameness that I first saw in 1990. Squat, colorless, lifeless buildings. The harshest critics called the city "dung colored". What I didn't know was just how lifeless. Yes, we all saw the pictures and heard the noise but I was naively unprepared for the destruction done to my old landmarks. The telecommunications building was barely supported by a few threads of blackened girders. The ministry of information where we were spoon fed the Iraqi line in the first gulf war was a hollow, ghostly concrete block. American bombs appeared to be aimed precisely. I didn't realize how massive their precision was. Our car slalomed through 10-foot-high piles of rubble to reach to the newly established Baghdad bureau of CBS News. The bureau still exists, now in its third location. We started in the business-friendly karrada area but when our neighbors began to carry more bombs than briefcases we moved to the Mansour Hotel (famous for housing Saddam Hussein's western human shields in the first war). We left there when the lobby was blown to bits by an al Qaeda suicide bomber, and are now in a fortified "media compound" from where I reflect on the last five years and see Iraq through dual prisms. One is a professional, detached view of Iraq as a story chronicling the ups and downs of warfare, the pluses and minuses of a struggling economy, the to-ing and fro-ing of reconciliation. This prism is easily focused. What's impossible is looking back through the lens of my Iraqi friends. My culture is stunned by and mourns the sudden death of those close to us. So do the Iraqis – but to a degree not familiar to me. Almost everyone of our local staff has had a family member or close relative killed – not one by Americans, but rather by the sectarian violence that has tortured the country. I am somewhat shocked by what seems to an outsider to be a casual acceptance of unexpected death, and at the same time I am awed by the resilience of the Iraqis. But they are tiring, drained five years into what many believe is a war without end. Numerous friends who were giddy with hope in 2003 ask if the consequences of the war outweigh the gains. They question whether peace without democracy was better than a war that was supposed to be liberating? From what I hear, it's a split decision. Unreal expectations that flourished in the early days as a mighty army swept a dictator away have, in many minds, been replaced by numbing frustration and resentment equally directed at America and an inept and corrupt Iraqi government. It's very surprising how many Iraqis appear more interested in the American presidential campaign than in their country's political stalemate. I guess it shouldn't really be a surprise. Iraqis who live for hours without power or water follow stateside news and see the November election as a referendum on their future. And there is an understandable tiredness among many American soldiers and Marines some serving here for the fourth time. They are justifiably proud of the gains made on the security front, more than justifiably angry that the Iraqi government hasn't seized the opportunity to unite their fractured people. A lot of the "boots on the ground" see a disengagement back home, kind of an onset of Iraq fatigue. Experts on insurgencies say they have a nine-to-10 year life span. If true the first half ends today. A tired group of Americans and Iraqis don't look forward to a second half.